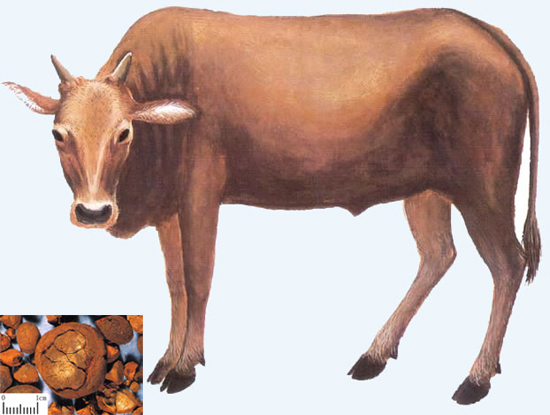 Part Used & Method for Pharmaceutical Preparations: The gallstone of an ox is collected in any season, or the bile of an ox or pig is used instead. After gathering, the material is dried and made into powder or pills. Properties & Taste: Bitter and cool. Functions: 1. To clear heat and release toxins; 2. To eliminate endogenous wind and stop convulsions; 3. To resolve phlegm and promote resuscitation. 1. Loss of consciousness and convulsions caused by high fever. Ox gallstone (Niuhuang) is used with Coptis root (Huanglian), Rhinoceros horn (Xijiao) and Musk (Shexiang) in the formula Angong Niuhuang Wan. 2. Sore throat or ulcers and boils due to accumulation of toxic heat. Ox gallstone (Niuhuang) is used with Natural indigo (Qingdai) and Honeysuckle flower (Jinyinhua). 3. For sore throat, ulcers in the mouth, carbuncles, and boils, it is used with Radix Scutellariae (Huang Qin) and Realgar (Xiong Huang) in “Bezoar Bolus for Resurrection” (An Gong Niu Huang Wan). Dosage: 0.2-0.5 g used in bolus or powder. Appropriate quantity for external use. Cautions & Contraindications: Contraindicated in pregnancy and for use in patients with Excess Heat.